Distinguished Scientist Sam Sanderson, Ph.D.
Exuberant biochemist. Collaborative scholar. Eternal optimist. Posthumous Distinguished Scientist. Sam Sanderson, Ph.D., would have said the latter -- among the highest recognition UNMC bestows on its researchers -- was "the cat's pajamas," an oft-used catchphrase of his. Dr. Sanderson, who died Aug. 8, 2017, at age 63, is being recognized posthumously as one of UNMC's Distinguished Scientists for 2017. 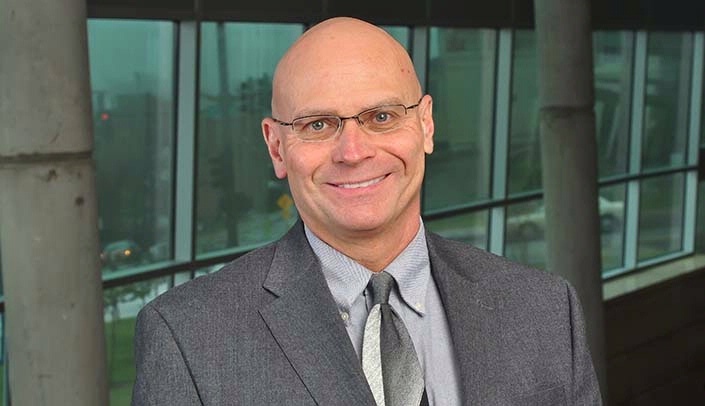 Dr. Sanderson worked 27 years at the medical center, most recently as research associate professor in the UNMC College of Pharmacy Department of Pharmaceutical Sciences, and founded the startup company, Prommune, Inc., in 2002, based on his research. Years ago, Dr. Sanderson and his collaborators discovered an immune stimulating peptide called EP67, a "platform technology." The synthetic peptide works by stimulating and enhancing a more robust natural immune response to normal and resistant infections, and potentially other ailments such as cancer. Dr. Sanderson once said: "I've always felt that one's research doesn't mean much if it's not structured to get out of the lab and into the hands of the people who could benefit from it." Unfortunately, there's often a decades-long chasm between making a discovery and that discovery making a difference in human lives. Dr. Sanderson sought to shorten that period by founding Prommune, Inc., in hopes industry might step in to help move the research forward to translation. He often worked closely with UNeMed, UNMC's technology transfer arm. Collaborators and colleagues agree his passion in the area of anti-viral research and vaccine development never ceased. In 2016, Dr. Sanderson earned a $2.25 million R01 grant from the National Institutes of Health to find a workable solution to the problem of antibiotic resistance based on technology he had patented. That year he also teamed with UNMC researcher Joseph Vetro, Ph.D., on another significant R01 grant totaling $1.75 million, which looked at EP67-based vaccines against cytomegalovirus or CMV -- a relatively harmless infection in healthy adults, but dangerous to those with a weakened immune system, particularly newborns, infants and the elderly. A prolific scientist and inventor, Dr. Sanderson's publications and inventions live on and colleagues are hopeful that his scientific legacy soon will become a commercial reality. Congrats to all who thought to nominate Dr. Sanderson for this award. Sam was a great guy and an outstanding researcher. This is a great testimony to his work!